I mentioned in last week’s column that I volunteered to help coach the 2019 Cape Henlopen High School golf team. I am looking forward to the experience. Nonetheless, I must complete several preliminary steps before I can join head coach Rob Harrod and assistant coach Sam Purple on the links with the young Vikings. First there was a required TB test, which thankfully I passed. No need for that drama. Then there was the criminal background check with the State Bureau of Identification. It was nice to learn to that my own memory of a clean criminal slate dovetailed with the state and federal authorities. On March 15 I attended a coaches’ meeting at Newark Country Club with Tom Neubauer, the executive director of the Delaware Interscholastic Athletic Association. Neubauer discussed several medical and practice requirements for scholastic coaches, such as concussion protocols. I confess I hadn’t thought about concussion risks on a golf course, but the DIAA and the State certainly had. Neubauer noted the requirement that head coaches have at all times a medical history card for each player that also includes a signed consent to treatment. If an EMT is called to a golf course for an injury, those consents permit a speedy response. Coaches are also required to develop an emergency action plan for on-course incidents. That should be coordinated with the golf clubs that host the matches. Other rules include a prohibition against smoking that is broader than I expected. There is no vaping, no chewing, no dipping, no nothing even remotely connected to tobacco or nicotine. There’s also no cussing allowed on the golf course. I will need some practice with that one. I was impressed at the steps the DIAA takes to make sure that scholastic sports present a safe environment for effective athletic education for the players, in this case far from school grounds. The More Card by Aproach Golf uses a unique scoring system to improve short game skills. 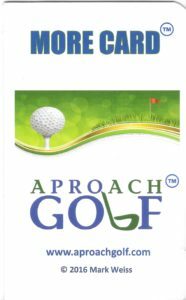 We also learned about a new coaching opportunity, courtesy of the folks at Aproach Golf. Co-founders Mark Weiss and George McFadden developed a coaches’ version of their new playing system that could be very helpful in training young golfers to understand that the short game is where real improvement takes place. Several coaches attending the DIAA meeting played a sample Aproach golf game on the front nine at Newark. For example, an Aproach tee sign on the first hole was set in the rough, about 80 yards from the hole. Varying points are scored based on holing out, making the green, having the approach shot land within a flag-length of the hole, one-putting, two-putting, and so forth. Other “tee boxes” forced players to hit over bunkers, over a pond, from 50 yards out in the fairway, and lastly from a greenside bunker on the ninth hole. Using what Weiss calls the More Card, players record the results for each hole based on how they played it. In the coaches’ version, an Excel-based trend analysis sheet keeps track of the rounds. Eventually the scoring data show what parts of the player’s short game are in good shape and which need more focus for improvement. Weiss explained that their system provides coaches with special tee markers, the More Cards, and the analysis program. The app for online posting and analysis is available in IOS, and the Android app is forthcoming. Weiss said Newark CC and other clubs have also enjoyed playing Aproach Golf in twilight or mixed leagues. At least one school in Delaware has already signed up for the Aproach license, which retails for $199 for the base edition. Young golfers are well known for their keen interest in hitting long drives, with far less interest shown in the short game. Many older golfers have the same attitude. The Aproach Golf system can provide a competitive practice environment and also enhance short game skills development. For more information, go to aproachgolf.com. The Lewes Lions Club is holding its 2d Annual Golf Classic Sept. 9 at Mulligan’s Pointe. Once again the Tunnell Center’s Patient Special Needs Fund is the prime beneficiary. March may seem a bit early to mention a September charity golf tournament. However, it can take a fair amount of time and effort to line up sponsors for such worthy events, especially when there are so many fundraisers scheduled in the Cape Region throughout the golf season. The Lions seek sponsors with several different levels of support, from a tee sign for $100 up to a $5,000 Platinum level that includes two foursomes, a banner, and recognition at the post-round dinner. For more information, contact Joe Donohoe at joedonohoe@comcast.net or 610-368-1228. As before, I am happy to publicize this and other Cape Region charity golf events. If you are seeking participants, please let me know at least a month before the event, so that folks can put the tournament on their calendar. If you need sponsors that advance notice should be much earlier, as in this Lions example.